As you have probably seen on social media, Saucy Mama invited me again this year to participate in their annual recipe contest. 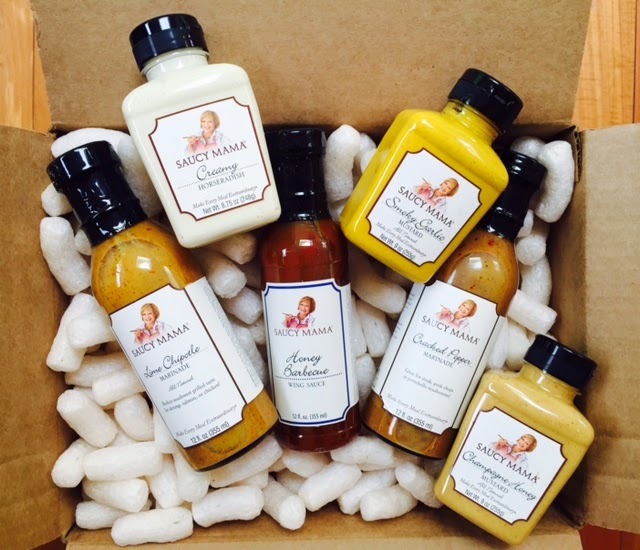 They sent me an array of delicious condiments and sauces to help me make delicious magic in the kitchen! 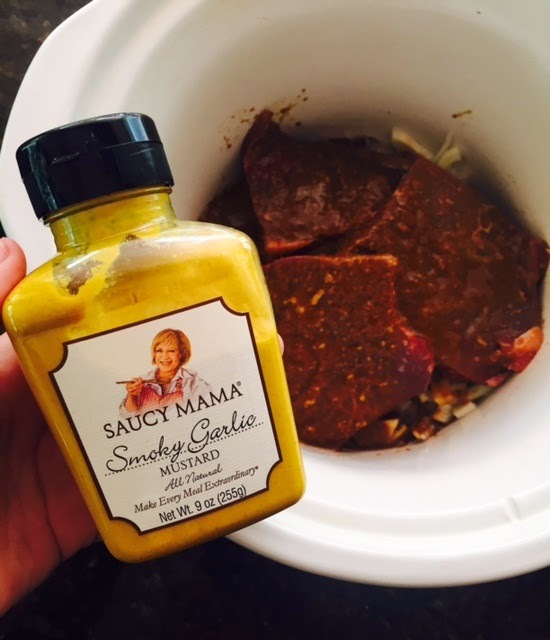 I even get to offer a #SaucyMama prize pack to a lucky reader (in the U.S. only)! Just enter the Rafflecopter contest below, and I'll announce a winner on June 3, 2015. Just tell me: what three products would you choose from this list (anything except olives is fair game)? Simply comment with your three choices at the bottom of this post. Enter before June 2 in order to qualify for the giveaway. Good luck! Now, I know you're wondering what I made for the contest. Well, you may have a clue since there's a big ol' photo of it at the top of this post. And now you want to know how I made it, right? Of course you do! Because it looks delicious and you love delicious things. This sandwich is inspired by a Banh Mi, a Vietnamese sandwich of grilled meat and pickled veggies on a crusty baguette. My version slow-roasts an inexpensive cut of steak in a rich mustard sauce until it is falling-apart tender, then tops it with crisp and cool vegetables, as well as a creamy horseradish spread. It's an amazing balance of flavors, textures, and temperatures. And the fact that it's mostly made in a #Crockpot means it is super, crazy easy. Grease your slow cooker. Toss onion slices in the bottom of the Crockpot and place the pieces of steak on top. In a small bowl, mix together the mustard, horseradish, Worcestershire, and red wine vinegar. Pour over the steak, flipping each piece to make sure the sauce coats both sides of the meat. Set your slow cooker to high and set the timer for four to six hours. Now, to make the quick-pickled carrots: in a bowl, stir the sugar and salt into the vinegar until dissolved. Toss the carrots in the vinegar mixture and cover tightly. Let the carrots sit on the counter to marinate at room temperature while your steak is slow-cooking. When your steak is fork-tender, slice open your rolls and toast until golden and crispy. Slather them in Saucy Mama's Creamy Horseradish (this stuff is cool, spicy, and addictive! But if you like a less spicy sandwich, just mix the creamy horseradish with a bit of mayo before adding to the bread). Top with some of the roasted steak and onions, then cucumber slices, a few forkfuls of the pickled carrots, and a sprinkle of chopped scallions. You'll find that the rich mustard-braised beef is perfectly complemented by the cool cucumber slices; the sweet and tangy carrots; the spicy, creamy horseradish; and the crisp and airy bread. Thanks so much to Saucy Mama for the inspiration and the delicious condiments! Remember, if you want to win a prize pack of Saucy Mama products, post a comment below and let us know which three products you would love to try! The apricot ginger would be an awesome glaze for chicken, I think and the lemon tarragon would really dress up a tuna salad! And of course I need the creamy horseradish to make your sandwich!!! Your Banh Mi looks amazing - love the horseradish!! Smokey garlic mustard sounds SO good!! I WOULD CHOOSE BACKYARD BRAT MUSTARD, CRACKED PEPPER MARINADE AND ZESTY COCKTAIL SAUCE. It's so tough to choose just three products since I'm such a mustard addict lol. I especially love spicy and garlicky foods, so I'd have to narrow it down to the hatch chili mustard, the smoky or creamy garlic mustard, and the apricot ginger mustard (sounds so unique!). Thanks for the giveaway! I'm a total mustard freak! The smoky garlic mustard is delish; I also got the champagne honey mustard, though I haven't opened it yet. Waiting for the right occasion, lol. I would like the cracked pepper marinade, the garlic sauce, and whichever one you recommend! Thanks! I think that I would pick the Creamy Garlic mustard, Saucy dill mustard and the creamy horseradish. All great choices! Good luck! The Smoky Garlic sounds delicious. This looks so good! So does the horseradish one, the garlic mustard and the backyard brat! You'd be all set for a backyard BBQ! I would get the chipotle mustard, the hatch chile mustard and the smoky garlic mustard. All of these would be a unique experience for me. As far as I can remember, the only mustard I have ever eaten are the off-the-shelf plain yellow varieties. You had me with Bahn Mi! I love Vietnamese cuisine.